Comet ISON Gets Roasted by Sun and Vanishes, But Did It Survive? This time-lapse image shows Comet ISON approaching and leaving during its slingshot around the sun – represented by the white circle -- on Nov. 28, 2013. The ISON images clearly outline the curve of the comet's orbit path. The images were captured by ESA/NASA's SOHO mission. The sungrazing Comet ISON vanished from the view of NASA's Solar Dynamics Observatory (SDO) during an extremely close encounter with the sun on Thursday (Nov. 28), leading scientists to suspect the worst. But late Thursday night, images from another sun-watching spacecraft, the Solar and Heliospheric Observatory (SOHO) run by NASA and the European Space Agency, picked up a blip of something rounding the sun in a camera called LASCO C3. "Now, in the latest LASCO C3 images, we are seeing something beginning to gradually brighten up again," comet expert Karl Battams, of the U.S. Navy Research Laboratory in Washington, D.C., wrote in an evening blog post. "One could almost be forgiven for thinking that there's a comet in the images!" Going into the solar rendezvous, Comet ISON was less than a mile wide and made up of 2 billion tons of ice and dust, NASA scientists said. 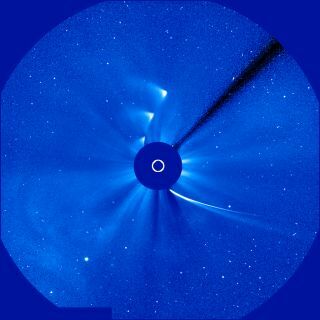 What the comet, or comet fragment is now, though remains to be seen as scientists review images from SOHO and NASA's twin STEREO sun observatories. "We have no way to estimate nucleus size from SOHO or STEREO and it's just way too early to speculate on ISON's future," Battams told SPACE.com in an email. "It is only a few hours old if we consider its survival as a 'rebirthing.'" Astronomers and skywatchers had high hopes for Comet ISON. Its discovery 14 months ago gave scientists an unprecedented lead time to track the comet. Because of its close approach to the sun, the comet had the potential to become a brilliant object in the night sky, leading some scientists to dub ISON a potential "comet of the century." Ben Leshchinsky sent SPACE.com this image of Comet C/2012 S1 ISON over Oregon's Willamette Valley and Cascade Mountains on Nov. 21, 2013. Interest was so high that Battams and his colleagues assembled a Comet ISON Observing Campaign in conjunction with NASA to track the comet. NASA spacecraft, including orbiters around Mars, Mercury as well as the Hubble Space Telescope, photographed the comet from space while amateur and professional astronomers observed it from Earth. Scientists also hoped to learn more about the building blocks of our solar system from ISON, which is a relic from the formation of the Earth and other planets 4.5 billion years ago. Comet ISON comes from the Oort cloud, a vast realm of icy objects that surrounds the outer solar system. By studying the comet's orbit, scientists think this is ISON's first trip to the inner solar system, and that the comet won't return for millions of years, if ever. A visible comet once more? While Comet ISON did not brighten as scientists had hoped on its way into the inner solar system, it did flare up to become visible to the naked eye in recent weeks as it neared the sun. If it survived the trip around the sun, some scientists were hopeful the comet would brighten enough to remain visible to the unaided eye. "I think the next couple of days will be interesting and hopefully that will be enough time to figure out what is really going on," solar astrophysicist C. Alex Young told SPACE.com. "On its journey here, ISON has been an odd comet for many of the comet experts and it continues to not disappoint."